The colors that I have now are my hand dyed curly or chrimp-y wool fibers, so there are many colors/shades and sometimes different textures in a baggie. I don't know how to show the colors which are constantly changing. The best way to buy my rovings is in person at a show. Here on line you could email me with the colors you need, and I would chose from what I have at the moment and photograph them and send that to you for approval, if you like, or you could trust me that the colors I send you will all look gorgeous together. Our wool rovings all come in a 4" x 6" bag, washed and ready to felt. Each bag has more than enough to complete a few sheep (or other critter applique of your choosing). The curly ones also are suitable for doll hair and Santa's beard. My fibers are all right off the sheep which I washed and dyed. 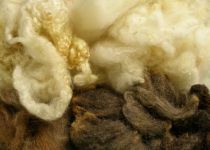 Some fibers you can buy from other people are combed, where they all are going in the same direction on a long "rope" of wool. If you use fibers that have been combed, pull a piece off like string cheese, rather than cutting with scissors. Lay the piece in your hands and pull the fibers apart, then layer them together again and pull apart to get the fibers going in all different directions. Then take a small amount (a wisp) and build up your critter or background felting. You can make some areas thicker than others on your critter, making a bas-relief. 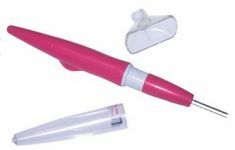 Because the needle on the Clover pink felting tool are close together, you can drag loose fibers back to the edge of you applique to make a neat edge. The tool's needles are replace-able by unscrewing the handle and the broken needles will fall out and can berefilled in no time flat. Use the tool straight up and down, and the needles can last a long time. Bent needles can be used singly in your hand for details. Most of the rovings nowadays are mixed in the baggies, so you will get, not one shade throughout the baggies, but several since I feel that variety looks best. So you might get two values of the same color or three different greens. All Rovings ship FREE in the USA! Which rovings would you like?